2012 Daytona 675 released - More bang for your buck!!! Triumph has announced a number of changes to its iconic Daytona 675. Following on from the success of last year's white and blue Daytona 675 coloured special edition, Triumph is introducing another of its class-leading Daytona sportsbikes with an even higher specification. The best supersport bike in the world or a simply in a class of its own? 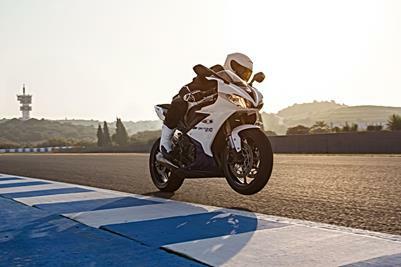 Designed for the racetrack, to compete with the best in the supersport class, Triumph's Daytona 675 is the bike to beat on both road and track. Triumph is introducing a special edition of its award-winning Daytona 675 supersport model, featuring a lustrous new Pearl White colour scheme, complemented with a distinctive Sparkle Blue frame, swingarm and subframe. Triumph's award-winning Daytona 675 has been revised and updated for the 2009 season with a host of modifications to improve the bike's already class-leading handling and performance. Triumph's award-winning Daytona 675 has been revised and uprated for the 2009 season with a host of modifications to improve the bike's already class-leading handling and performance. Daytona 675 Wins International Bike Of The Year! Not content with an already award-winning 12 months, the irresistible Triumph Daytona 675 triple has now received the ultimate accolade with victory in the prestigious International Bike of the Year (IBOTY) award. Triumph's stunning Daytona 675 has been awarded Australian Motorcycle News' 2006 Motorcycle of the Year (MOTY).